GIGA GRANADA HILLS: North Valley Vegetarians Unite! The following review of Vegetable Delight is reprinted here courtesy of my former Granada Hills High School classmate David Elsensohn. Dave runs a superb site called Dining In L.A. -- check it out for more city-wide food reviews, conveniently organized into cuisines by specialty, by region, and by neighborhood. Admittedly, if I was hired to track down some really outstanding and innovative vegetarian Chinese food, I would not expect to search along the aging stretch of Chatsworth Street in Granada Hills, within a thousand feet of my old high school*. But there it is; Vegetable Delight, despite its wartorn exterior, has my full support. Stare for a moment at the beautifully carved wooden mural in the window before entering. Walking inside, you may wonder if you have plunged down a rabbit hole into a wedding in Toyland. 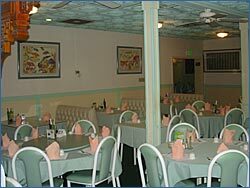 Rows of gold-trimmed white booths gleam under ceiling tiles of powder blue; the water glasses are stuffed with baby pink pastel napkins. Somehow it's a happy absurdity, especially with the sound of keyboards and strings plunking Chinese melodies above, or of bereaved little piano concertos. You suddenly realize that the room has the same salmon-and-spearmint color scheme as a Madame Alexander doll box. You may also suddenly wonder why Dave knows what the Madame Alexander color scheme is. This is what you must order, because we say so. The "Chinese Pancake" is puffed and very slightly sweet, not entirely dissimilar to a wonton, perfect as is but utterly gush-worthy when you drip some of the lemony sauce over it. It is the appetizer of champions. The Hot & Sour soup is pleasingly gelatinous, not dense enough to stand a spoon in but slowing everything down to a meditative crawl. It is rich, and beautiful, and obviously not one of those packaged deals other Chinese places might dole out. The Spring Rolls here also seem fresher than expected. The Veggie Fish in Hot Bean Sauce may or may not have MSG, but is made of OMG. It looks a little dubious what with the lonely and purposeless carrots, peas and corn, like one of those TV dinners that used to come covered in foil instead of plastic. Pay no attention. These deep-fried "filets" with a thin skin of seaweed have a light crunch, in a thick, not-really-hot orange sauce, are insanely good. The chefs at Vegetable Delight are concerned with making flavorful dishes rather than merely cranking out the usual fare with meatless analogs. The Tofu with Hot Bean Sauce, despite its similar naming convention, is totally different. 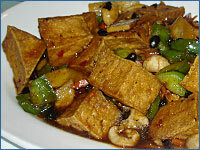 Lightly fried triangular prisms of tofu** are combined with chopped green pepper and tiny mushrooms cut into quarters, as if to resemble peanuts; the sauce is thinner but soaks into the tofu nicely. 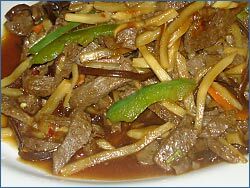 The Szechwan Shredded Veggie Beef has a slight textural resemblance but isn't fooling anybody. 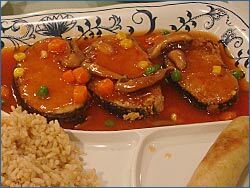 However, it's got a full-bodied presence, and combined with carrots and Chinese mushrooms cut into scalloped lengths, it's downright savory. They kindly provide small dishes of red chili paste, decently hot, and a strong, take-a-blowtorch-to-your-nostrils Chinese mustard. Vegetable Delight is open until 9:30 as Chinese restaurants often are, and are closed on Mondays, like restaurants over the hill often are. Come here for lunch. Why? 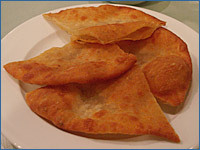 Lunch and a Chinese pancake, enjoyed with a cup of hot tea, is under ten bucks. * Going in the other direction, it's also a thousand feet from the seedy and abominable Oh Grady's, at which our good friends Bandwagon have played on occasion, and who hopefully will not be banned from Oh Grady's for my having called it seedy and abominable. ** This will be the name of my band if I ever create one. The Triangular Prisms of Tofu. Mathematically uniform and high in protein!